Week 1- 1st attempt. With wrong type of yarn suggested for the project but I had to try the pattern! Most of us are familiar with Facebook. I am a member and through Facebook I joined Blazing Hooks and a Mystery Crochet-A-Long group. I have never tried anything like this before and I thought it would be a lot of fun. The above photo is of the Med Project that we are working on in the group. We should have more directions this week so I cannot wait to see what is next! This past Saturday, February 25th was my 18th Wedding Anniversary! My husband took me to dinner at Mahogany Steak House in Oklahoma City. When we arrived, to my surprise on our dining table at the restaurant was a beautiful bouquet of flowers in wedding white colors. We had an absolute delicious meal starting off with Lobster Cargo. For dinner I had a nice lobster tail and some crab, the best lobster and crab I have ever had in my life so far! I had a few glasses of this delicious desert wine Moscato D'Asti. Oh my the sweet goodness of this wine.. I could definitely have a case stashed somewhere for sure! I finished off with a piece of the most awesome carrot cake with my wine, it was oh so fabulous indeed!! A humorous way to end the evening was by watching television shows called "Who in the bleep did I marry?" Why we chose those shows I don't have a clue but once we got into the show we had to see what happened. Oh Pearls & Lace are oh so pretty! This week in The Greetings Challenge at The Outlawz we want you to show us your feminine lace and pearl creations. Here is mine above! Here is my completed page for my Little Scraps of Heaven themed calendar for 2013. I was inspired to make these calendars by the Copic/Promarker group at The Outlawz. Over at Paper Craft Planet I joined in a House Mouse Card/Recipe swap in The HM Group. My swap partner Maria is living in Germany and this is the card and recipe I sent to her. I chose this card because I read she plays an instrument and I had made this card inspired by the song I love a rainy night by Eddie Rabbit for a previous challenge. The recipe has been a favorite in my family for as long as I can remember and I hope she loves it as much as we do! I love these Mieces to Pieces! This adorable little card was created and inspired by two separate challenges. The first challenge being Paper Craft Planets House Mouse Challenge Sketch, and the second being the Copic/Promarker challenge at The Outlawz. If you haven't stopped in at either web site you should they have a lot of fun creating! 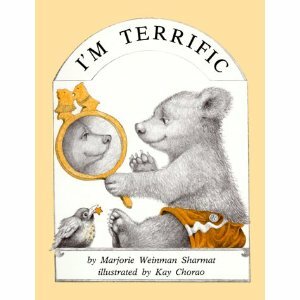 For the Copic/Promarker challenge: My card was inspired by the children's book written by Marjorie Weinman Sharmat’s and Kay Chorao’s picture book I’m Terrific. If you know me, you know I love the outdoors. I most especially love photographing birds. It is a frustrating hobby at times chasing a bird around a tree or across a state park trying to get that great shot only for the bird to fly away on you, or you have your klutz moment because you had the camera in your face and wasn't watching where you were going. The Eagle in the photograph in my card above was drawn by Anne Fenton for the Creative Freebie Challenge over at The Outlawz. It reminded me of our trip to the boundary waters of Canada/United States by way of Ely, Minnesota and we took a john-boat out on Fall Lake and spotted an eagles nest. I took as many photos as I could of the eagle and its nest. If you would like to have beautiful images like this to use for your cards and projects you should come play in the Creative Freebie challenges! Recipe Challenge at The Outlawz! Do you have a hard time creating a card to post in a challenge? You should try a recipe challenge! They really help! Guess what? We have just the recipe challenge to start with in the Greetings Challenge at The Outlawz! Hope to see you there! Just messing around with the art supplies tonight. Hello my online friends! I haven't had the chance to post this week. 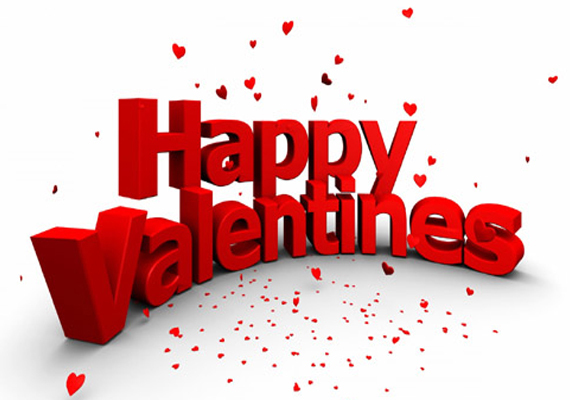 My valentine was so sweet, he bought me the works; we had a steak dinner at home and watched girlie romance movies till bedtime. I was very surprised to have received valentines presents with our anniversary around the corner. My question does anyone really like those box of chocolates? I eat the caramels and the coconut creams and what do they put in these boxes one of each? Any how the flowers were gorgeous and what a cuddly bear! The valentines card was sweet as ever he always writes a precious touching love note inside. He is such a wonderful valentine! There is GOLD behind all the Rainbows we find at The Outlawz! It is Monday and what a beautiful day it is, Even if it is snowing outside, the bright side over on the Greetings Team at The Outlawz we are thinking Spring showers, Leprechauns, Shamrocks and beautiful colorful rainbows! Come join the fun challenge! House Mouse - Mice Are Hungry Too! Oh my talk about cutest littlest mouse ever, don't ya just love the mieces to pieces!! Look at the card & recipe I received from Germany! I love how Maria turned her card into a piece of cheese!! This was perfect since the recipe for the swap at Paper Craft Planet had to consist of cheese in it. Maria was so sweet to include a magnet she had made of Germany, it is the coolest!! My fridge loves it! House Mouse - Feed the Mice! Isn't this card adorable!! I received this from Canada! This card was made by Josie the hostess of the Mice Are Hungry Recipe Swap at Paper Craft Planet. Each participant of the recipe swap was to make a card with a House Mouse or HM image and a recipe to feed the mice with. Josie was a sweet sneaky mouse and sent a recipe to everyone in the swap as the rest of us has designated partners to swap with. What a fun challenge in the Creative Freebie Challenge at The Outlawz! Here is what I created with the wonderful digi images of Sandy & Anne! Spent an evening making a couple of these adorable apple pot holders from a Liesure Arts brochure that was handed down to me from my mother! I wanted to give a friend something special for her birthday and I am hoping she likes hand made items like I do! Isn't that worm the cutest! I know we wouldn't normally like worms in our apples but this guy works for me! Anything Goes this week in the Greetings challenges at The Outlawz! I am gearing up for valentines day cards. Here's the image I decided to play around with for this challenge. Last Thursday was a close friend of mines 42nd birthday, I have known her almost 30 years and along with a few handmade crafty gifts the crocheted chicken pot holder, an apple potholder that you will see in an upcoming post and I decided to make her a cake with what I had learned last summer at my 1st Wilton's cake decorating class. This is the card I gave to her. Over at Paper Craft Planet they are challenging us in the HM group to make calendar pages. This is my creation for the month of February! I am so excited! 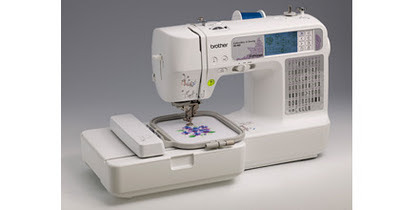 I have been wanting an embroidery machine for quite some time and almost spent thousands on an industrial machine once upon a time, but the birdie on my shoulder stopped me since I knew nothing of machine embroidering. I know a little about hand embroidery and cross stitch. When I didn't receive one of these machines for my 40th birthday last July and then not from Santa this year either, I decided to make an impulse buy on the HSN web site which I quickly cancelled when i discovered I could save over a 100 for the same machine with a different item number through Amazon.com and for the money I saved I can buy embroidery computer software and a beginners machine embroidery kit. I am so pumped! My only complaint would be that the beginners kit be included in the machine with a few samples of the stabilizer fabric as well as maybe a small project ideas guide would be nice. But that's okay I am lucky to have internet. Test run with the beginners kit colors had a little bobbin tangling and through off the entire design of the butterfly. I didn't research how to apply stabilizer so I think I may be using it wrong as well. Spent an evening crocheting pot holders from a brochure that my mother handed down to me. I made two of these chickens or roosters. Really thick and isn't he cute!